Posted on February 24, 2011, in Haiku My Heart, Himmelsk, my digital photos, my haiku, Sensational Haiku Wednesday, Share the Joy Thursday, Sky Watch Friday, Southern California, Southern Mojave Desert, wildflowers. Bookmark the permalink. 42 Comments. Wow, 3 this time… you’re on a roll, my friend! Wow – I have lupines in my Pacific NW garden. I didn’t know they grew in desert locales. Oh, thank you for sharing the flowers ! We are still in an expanse of grey/white here for the most part. Loved all of them! The last one was perfect with the photo! Everytime I see Lupines I am reminded of the story about the Lupine lady that I use to read to my girls when they were little. To this day this remark when they see the Lupines lining the highway. What a lovely photo….thank you. Love the Lupines and those vivid blue skies! Fantastic! Enjoy your weekend! Another lovely haiku and the photo is a delight to the eye. Beautiful capture. Such a wonderful sight in the desert! A beautiful photo of delicate, graceful lupines. What a beautiful picture! Lupines are some of my favorite flowers, I always had some in the gardens at my parents’ houses :o) Thanks for stopping by my blog and commenting! I didn’t know the name, very beautifully captured. Wonderful picture! Lupines are beautiful flowers! The glory of just seeing a flower in bloom just makes my heart pound. Spring! We just received a fresh coat of snow tonight. Nice and spiky plant with beautiful purple cluster of flowers. I think I’ve seen them grow in the wild here but today I learnt the name~ Lupine. Thank you for the share today! A very nice Lupine. Beautiful pictur. Beautiful picture of lovely purple lupins! Beautiful flower and beautiful blue sky. Now I will be dreaming even more about summer. I like the angle of this shot, everything reaching ever upwards. It’s barely six AM and everyone has Haiku up and running! I feel “late”. Nice job. Now I know what these are called. MMT’s flower identification and haiku blog. I hope I’m still out here when the desert wakes up this Spring. On the coast now until Monday. Good to stop by here. yes, flowers that lift the hem of dawn are holy holy holy. thank you for gracing my friday, oh how sweetly you haiku my heart! I love those flowers. Over here they are roadside flowers in the summer! And what a gorgeous blue sky! Wonderful shot. I like the flowers with the clear blue sky in the background. It makes me long for summer. 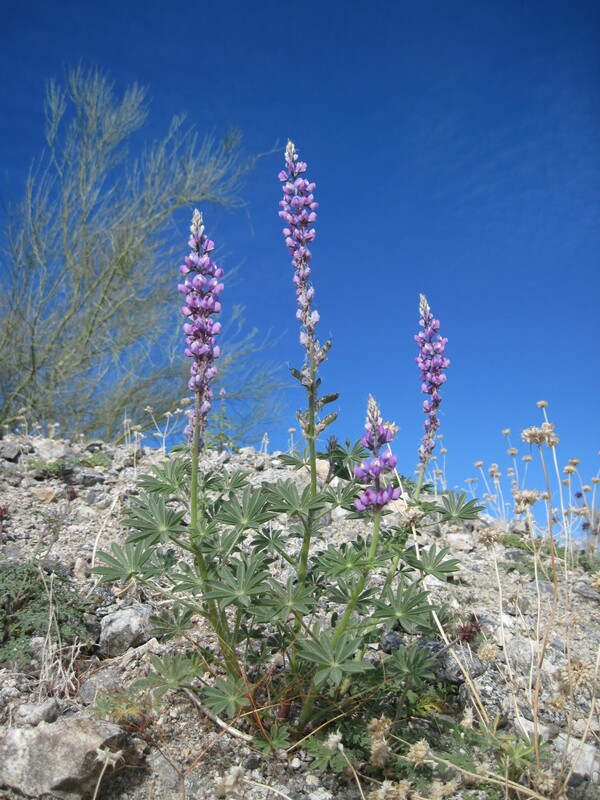 As a gardener, I really love seeing the lupines in the desert. I had no idea they could tolerate dryness like that. A gorgeous photo, also! What a gorgeous photo and the haiku suits it so well! Lupins are a passion of mine, they are part of British Railway history, passengers were given packets of seeds to throw onto the banks in the early days. The slip road to my town, that used to be a railway line is still clad with them. Gorgeous lupines! I love how the purple stands out in the blue sky but doesn’t contradict it – purple and blue DO get along! Great shot. Beautiful haiku and sky photo. I agree with the first comment. Lovely alliteration here.